FRAMINGHAM, Mass.--(BUSINESS WIRE)--Jun. 25, 2014-- Staples, Inc. (NASDAQ: SPLS) makes more fun, fashion and function happen with the debut of top products for the 2014 back-to-school shopping season. Staples carries a wide assortment of must-have essentials and the hottest technology for less, including Staples brand products with trendy new patterns, exclusive assortments from Teen Vogue and Nickelodeon, new glitter treatments and bright, colorful supplies. In addition to top products, Staples makes guaranteed savings happen on the widest selection of core supplies and technology with its back-to-school 110% Price Match Guarantee. Staples will match the prices of all competitors with retail store and online presence (as well as Amazon.com) plus give back-to-school shoppers 10% off the price difference, whether in store or online. Additionally, customers can shop however they want, whether it’s online, mobile or in-store at conveniently located stores nationwide. Additionally, the back-to-school Less List and weekly great deals offer shoppers even more savings. The Teen Vogue collection, exclusively at Staples, features Electric Jungle, Punk Prodigy, Rive Gauche and Festive Floral prints across an array of school supplies including notebooks, pens, erasers, folders, Staples BETTER® binders and more. Inspiration straight from the runway gives trendsetting students function with fashion. 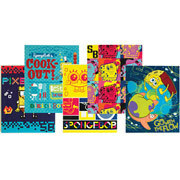 Staples offers unique designs on products including exclusive Nickelodeon patterns on Staples BETTER® binders, pencil pouches, die-cut erasers, notebooks, folders and clipboards that make it easy for students to show off their favorite characters from Teenage Mutant Ninja Turtles and SpongeBob. A wide selection of the latest tech tools at Staples will keep students up-to-date on the latest classroom and dorm room gadgets. Perfect for touch screens, the Slapband Stylus ($14.99) adds style to a traditional stylus while keeping it within reach anytime and anywhere as a bracelet on your wrist. Bring music to life with the wireless JBL Pulse Speaker with LED that has glowing, multi-colored visuals ($199.99). The easiest way to enjoy stream videos and music on dorm room TVs – just plug in and play with Amazon Fire ($99.99). Pick up the latest laptops, tablets and mobile phones at Staples but don’t forget the accessories. From tablet covers to 3-1 in charging cables and more, Staples has everything your tech savvy student needs. It’s easy to get your college students everything they need for the school year, even if they’re already living in the dorm rooms. Staples e-gift cards are an easy way to help your student replenish their school supplies. If you’d rather send them a care package full of essential supplies and snacks, Staples has you covered. Get everything you need at Staples and then head to our in-store Mail & Ship center where you can pick up packaging, labels and more. Our convenient in-store drop off hours with UPS and USPS lets you get everything done in one place, from purchasing to packaging to shipping. Stand-out students can work in color with Poppin® accessories. The Poppin® Mouse Pad ($9) provides a squeak-free experience as its pointy round shape slides right up to the computer. The colorful Poppin® Stapler is bound to get double takes as it adds flair and sophistication to any desk. Or dress up desks with the bright-colored Poppin® Tape Dispenser ($12) available in a variety of colors. Keep game-time excitement going with action-packed school tools such as the Staples® Game Controller Calculator designed to look like a game controller ($3.99). Get in the game with Staples® Sports Erasers (2 pack/$0.99), Staples® Fashion Clipboards ($3.00) or Staples® Sports Slider Pencil Cases that come in a variety of sports designs. Take a walk on the wild side with University of Style, Into the Wild and Neon Safari notebooks and composition books ($3.00) that add depth to note-taking in eye-catching colors. Or have zoo animal fun in the classroom with Staples® Animal Erasers ($1.00), Staples® Animal Pencil Sharpeners ($0.99) and Staples® Animal #2 Pencils ($0.65). Shimmering with shine, but important to keep to-do lists, class assignments and more handy, University of Style Glitter Notebooks and Composition Books are available in pink, purple and silver to satisfy any fashionista’s style. Or get #hashtaghappy with Gartner Studios Spiral Notebooks ($3.00) – social media-themed notebooks featuring #craycray, #overit or #whatevs. Add to the sparkle with sleek and sophisticated Staples® Sparkle Clipboards or Staples® Sparkle Binder Pencil Pouches. Find a variety of kid-friendly bags and accessories, perfect for toting favorite foods, snacks and drinks, from Staples. From a magical My Little Pony™ Lunch Box ($7.99) to a purrrfect Hello Kitty® Lunch Box ($9.99) to beyond the bots with a Transform Lunch Box ($12.99), Staples has a wide selection of bags to make lunchtime fun. To keep the on-the-go student quenched, Staples offers stylish and eco-friendly Glass Water Bottles ($19.99) or Mason Jar Water Bottles that keep drinks colder, longer ($9.99). Whether sporty designs or eye-catching prints, Staples offers a wide variety of backpacks all season long. The large High Sierra Swerve Backpacks with its distinctive swerve design and padded computer sleeve will comfortably carry everything all day long. JanSport Breakstar Backpacks are trendy and comfortable with multiple compartments to make organizing and transporting supplies easy. Keep it fun, functional and affordable with Extreme Basic Backpacks designed to carry all of your school tools in one place. Or bring out the prehistoric explorer with the Mad Pax Spiky Backpack, a fun and functional bag.